Christopher Anderson, MD, FACS, is double-board certified in general surgery and pediatric surgery with advanced training in minimally invasive surgery techniques for pediatric surgery. 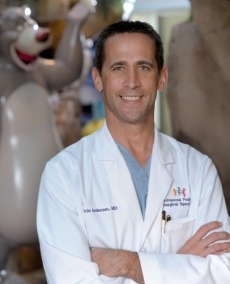 He is dedicated to providing the most advanced and effective treatments for thoracic and abdominal conditions in children, and his clinical expertise and outstanding patient outcomes have been recognized with Clinician of the Year and Surgeon of the Quarter awards from AdventHealth. A Phi Beta Kappa and honors graduate of the University of Iowa, he earned his medical degree at the same school before undertaking his residency training at the University of Texas Health Science Center in San Antonio. He also completed a research fellowship and two clinical fellowships in pediatric endoscopy and pediatric surgery at the Children’s Hospital of the University of Alabama and the University of Texas Health Science Center/MD Anderson Cancer Center in Houston, respectively.